Bringing in other people on your Action Item notifies them that you need help and gives them the opportunity to Resolve the issue or Take Ownership of the action. Note that adding participants does not assign the action to them. For formal task management, you may need to use the task functionality. For more information about the differences, see Mark for Action or assign a task?. Go to the content item that is marked for action. You can go to the item by searching for it or looking at your list of Action Items under the Actions tab in Inbox. Click the Actions or Action Item badge. Click Add Participants or . Select the users you want to add to this action item. Leave a note describing what you need. The note shows up only in the participant's Inbox, so it should let them know specifically what you need from them, for example, Provide remaining RFP information. The new participants see an alert in their Inbox, along with your note. They can then Resolve or Take Ownership of the item. Go to the item and click Actions > Mark for Action. 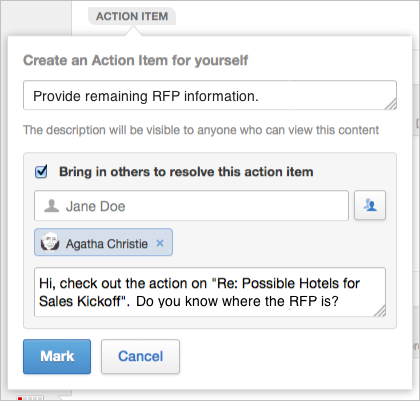 Add a general description of the action that anyone in the community will be able to see when they click the Action Item badge, for example, Provide remaining RFP information. Select Bring in others to resolve this action item.